A preliminary report into a fatal Irish Coast Guard helicopter crash has found that the island it crashed into was not included in the aircraft's onboard obstacle warning system. Rescue 116 crashed into Blackrock Island on 14 March. The report includes analysis of the aircraft's flight recorder and cockpit voice recorder. It indicated that the crew became aware of the island seconds before impact and attempted to avoid it. 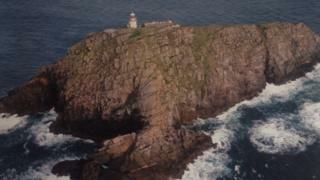 Four people were on board the helicopter when it came down off the County Mayo coast. Crew members Paul Ormby and Ciarán Smith have been missing since the crash. Capt Dara Fitzpatrick died after she was rescued from the sea hours after the incident. The body of her co-pilot, Capt Mark Duffy, was later recovered from the wreckage. The wreckage of the helicopter was lifted from where it crashed near Blackrock earlier in April. The helicopter was dispatched from its base in Dublin to assist with a medical emergency on board a fishing vessel. The Air Accident Investigation Unit's preliminary report indicates that the helicopter was on its way to Blacksod in County Mayo when it crashed. It reported that Blackrock and its lighthouse was not included in the obstacle and terrain databases for the helicopter's Enhanced Ground Positioning Warning System (EGPWS). It said that in the final seconds of flight "the helicopter pitched up rapidly, impacted with terrain at the western end of Black Rock and departed from controlled flight". The report has made an interim safety recommendation that CHC Ireland, the company that operates the Irish Coast Guard's helicopters, review all route guides used by its aircraft. The report added that the investigation is continuing and a final report will be published in due course. The unit has previously said that there was no indication of any mechanical problems in the seconds before the impact, and that the focus of the investigation would be operational aspects such as human behaviour, navigational controls and procedure issues.